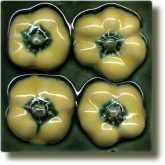 Angela makes and glazes her ceramic feature tiles entirely by hand. Starting with wet clay, she uses a mixture of traditional methods and her own special techniques to create unique tiles which have a totally different quality to ordinary factory-made ones. She applies earthenware glazes to the fired tiles by hand. Angela takes some of the inspiration for her designs from the garden: fruit, vegetables, flowers, butterflies and birds. To this domestic menagerie she adds more exotic fish, lizards and imagined creatures. She also draws on the landscapes and cityscapes of Sussex. 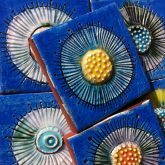 Angela has been making her tiles since 1992 when she completed her BA in Wood, Metal, Ceramics and Plastics at Brighton University. After graduation she spent some years in the studio of Kate Malone, one of the judges on the BBC's Great Pottery Throwdown. In 1998, she relocated from London's trendy Hoxton Square to a larger studio in her home town, Brighton, East Sussex on the south coast of England. Angela now works from a purpose-built studio in the vegetable garden. She has exhibited at Chelsea Craft Fair in London, Hatfield House and Hidden Art of Hackney and has been featured on Channel 4's Collectors' Lot. She has also created designs for Fired Earth. See Press Cuttings. 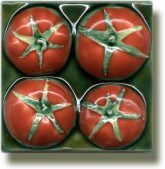 Handcrafted Ceramic Tiles, Mike Jones, Janis Fanning. 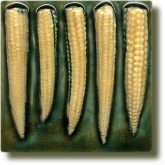 Apart from ceramic tiles Angela makes wall plaques, sconces, candle holders, Christmas decorations, panels, plates, bowls and flower pots for the home and garden. She sells through selected shops and galleries and at shows around Sussex and Surrey. Angela also produces mirrors, panels and furniture using one-off tile designs to individual commission. Contact us to discuss your requirements. Interior design projects include the King's Brasserie at Stamford Bridge, Chelsea, London. 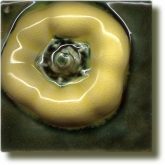 Angela has taught tile-making courses, including at West Dean College, and does ceramic projects in schools.